One of our volunteers, Jeremy, tells us about how an encounter with a book of remembrance in the archive has led him to trace the stories of those from the university involved in the First World War. I started researching the Great War Dead of University College, Reading after being shown the Memorial album containing the names of 141 people who lost their lives, together with photographs of 119 of them. The collecting of photographs as a means of remembering those who died in the war was suggested by Dorothy Nölting at a meeting of the Student Representative Council on 4 November 1915. In October 1919, the Council decided that the photographs should be mounted in an album and displayed in the Union Common Room. That work was carried out by Clara Wilson, a former student of the College and member of staff in the Art Department, and was completed by 28 June 1920. 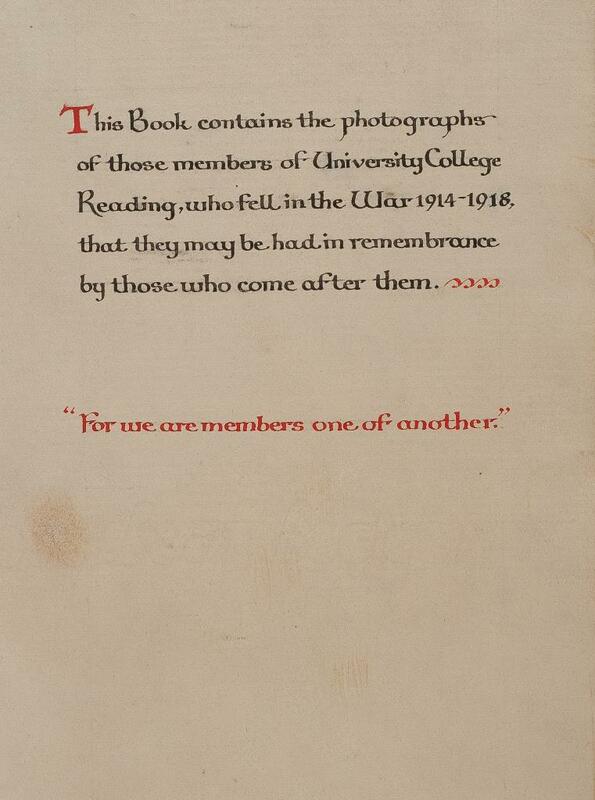 The inside cover of the Book of Remembrance of those Members of The University College Reading who fell in The War 1914-1918 (MS 5339). The volume contains black and white photographs of each person, with name, rank and regiment and a list of those fallen. Four years later the College completed the building of a War Memorial in the form of a tower containing a bell and clock. The original intention had been to erect a tower alongside the College Hall at an estimated cost of £5,000-£10,000. It was not possible to raise this amount and the existing tower was built at a cost of £2,750. By the time of the tower’s dedication on 7 June 1924 the list of those who had died extended to 144 names. However, this list excluded two names included in the Memorial Album: those of Francis Edgar Pearse and Wilfred Owen. Was their omission deliberate or accidental? Was it at the request of their families? Were Owen and Pearse deemed in some way not to be members of the College? It would be nice to know why this happened, but so far I have failed to find any explanation. 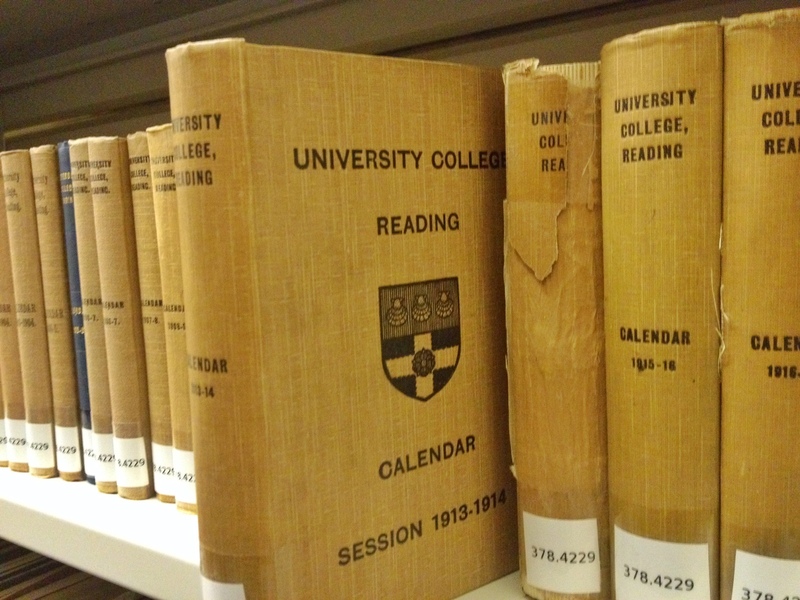 The University Calendars, available to browse in the open access library at the reading room (378.4229). In trying to find out more about those who died I looked at a number of sources held by the University of Reading Special Collections Service. The College Calendars contained lists of academic and administrative staff, together with the names of students who had passed examinations, won prizes, been awarded scholarships, and been made associates of the college. They also contained the names of students who held positions within the various student bodies, clubs and societies. The University College Review, which was last published in December 1916, contained the Roll of Honour, obituaries of those who died and details of those on Military Service. The Old Students News, published annually but not in 1918 and 1919, contained similar details to those in the Review. Tamesis, the Student magazine, also contained the names of those on service and those missing, wounded or killed. Additionally, I trawled through boxes of University Archives in the hope of finding something useful. I hoped that I might find details of those students who had been members of the College’s Officer Training Corps, but whilst record cards exist for those who were members of the Corps after the Great War, I have not found any such records for those who were members before 1914. 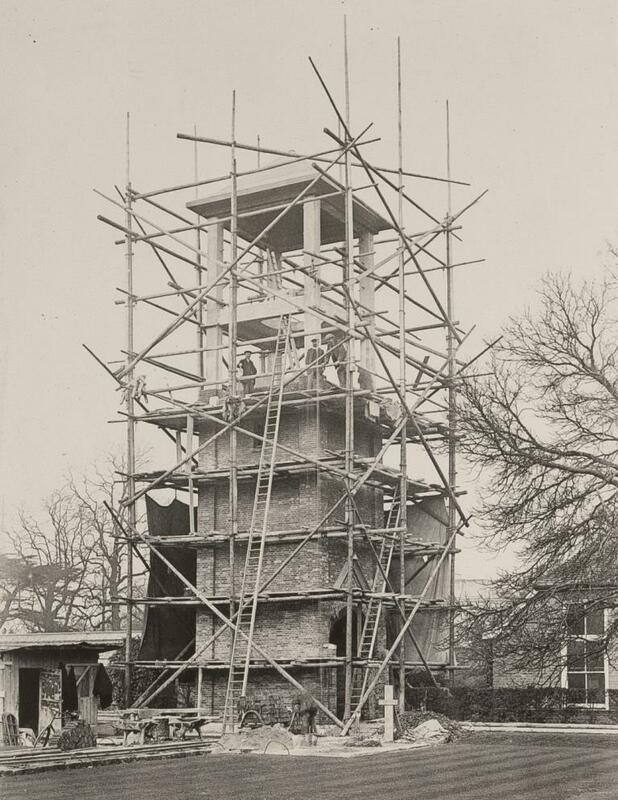 The Memorial Clock Tower during its construction at the heart of the London Road campus in 1924 (MS 5305/M162). Starting, I assume, in 1924 and continuing until 1938, the bell in the Memorial Tower was tolled 144 times on 11 November starting at 10.45. At 11 o’clock the bell was struck just once to mark the start of the two minutes silence. Whilst the formal remembrance of the Great War dead continued until the outbreak of the Second World War, I found an item in Tamesis (Vol XXXI, No 1, 1932) that indicated that, with the passage of time, details of those who had died were being forgotten. The article noted that the list of names on the Memorial Tower contained that of one woman, Florence Mary Faithfull (a Voluntary Aid Detachment nurse), and requested information about her. A contribution to Vol XXXI, No 3 provided some details, but we are now able to say so much more about her life and death. Florence was born in India in 1891, the second of five children, to William Conrad and Constance Mary Faithfull. William was an officer in the Indian Army. In 1905 Florence and her elder sister, Constance Ellen, entered the Edinburgh Ladies’ College (now the Mary Erskine School). Florence then studied Commerce at Reading 1909-12. I don’t know what she did after leaving the College, but during the war she nursed, initially, at Fir Grove Military Auxiliary Hospital, Eversley. Her Red Cross record only runs from June 1917 when she went to Salonika. She then went, as part of the 65th British General Hospital, to Basra, and it was here that she lost her life on 15 January 1918. This was not the result of enemy action, but of an accident. The launch, Smelt, in which she and thirteen other members of the hospital were travelling, was in collision with a steam tug. Florence and three other nurses were drowned, although Florence’s body was not recovered until 2 February 1918. The four nurses were buried in adjacent graves in Makina Cemetery (now part of Basra War Cemetery). What I, and others, have found out about those from the College who died can be seen at www.flickr.com/photos/reading_connections/albums. There is still more to do as we have yet to properly identify H Turner, probably an evening student who may have served in the Royal Navy, and have yet to explain the omission of the names of Francis Pearse and Wilfred Owen from the Memorial Tower. Find out more about accessing the archives here. This entry was posted in Reading Readers, Uncategorized. Bookmark the permalink.